Wildlife Habitat Canada invites Canadian wildlife artists to participate in an art competition held annually to select the image for the Canadian Wildlife Habitat Conservation Stamp and Print. Although the Art Competition is by invitation only, Wildlife Habitat Canada welcomes new Canadian artists that may be interested in submitting a piece to the competition. For new Canadian artists wishing to participate in the competition, please send an artist CV and website link where your artwork can be viewed (or provide samples of your work) to skaddoura@whc.org. The review is part of an evolving process, with the aim of making the program better through the implementation of our collective ideas and responding to changes in the market. We want you to be satisfied with the program, therefore, your input is essential in shaping its future direction. Past and current participating artists are invited to complete the questionnaire by April 18, 2019. THE COMPETITION HAS NOW PASSED. 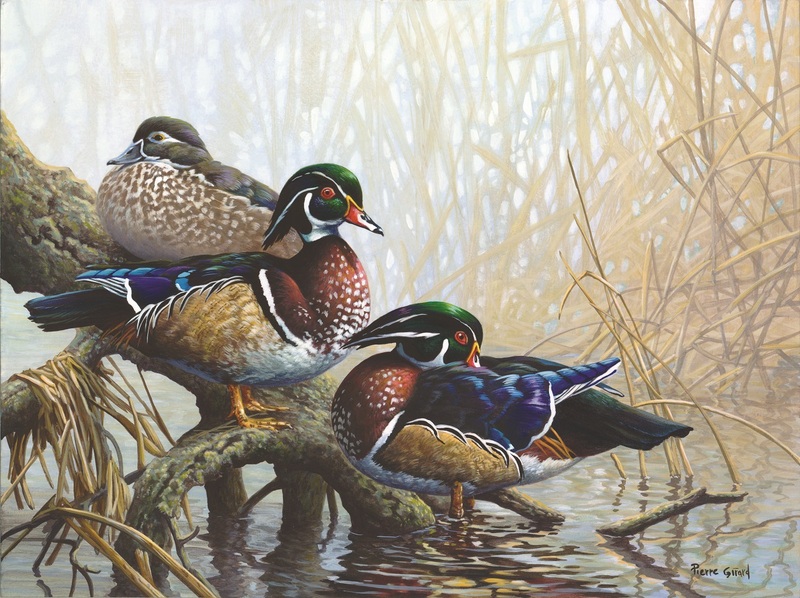 The winning painting was revealed on April 1st, 2018 and features the Wood Duck (Aix Sposa) by artist Pierre Girard of Sorel-Tracy, QC. Click here to learn more about this year’s winner. 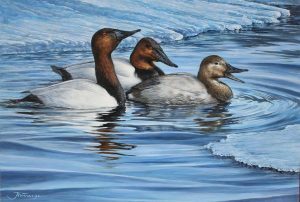 The winning painting features the Canvasback (Aythya valisineria) by artist Claude Thivierge of Rivière-Beaudette QC. The painting is entitled Blue – Canvasback. The 2020 Art Competition was held in November 2018 and featured the Northern Pintail (Anas acuta). The winning image will be unveiled on April 1, 2020. Every year, WHC receives numerous paintings for the Art Competition. Each one is meticulously painted by a Canadian artist and is unique, offering a different perspective of the selected species. While we are limited to choosing only one finalist as the winning painting, the quality of art that we receive does not go unnoticed and we would like to showcase it. Click on the images below to see the art entries that we have received over the past few years. View all the entries for 2019. View all the entries for 2018.